Applewood Farmhouse Restaurant provides guests with a chance to enjoy the days when every meal was made from scratch in Mama's kitchen. 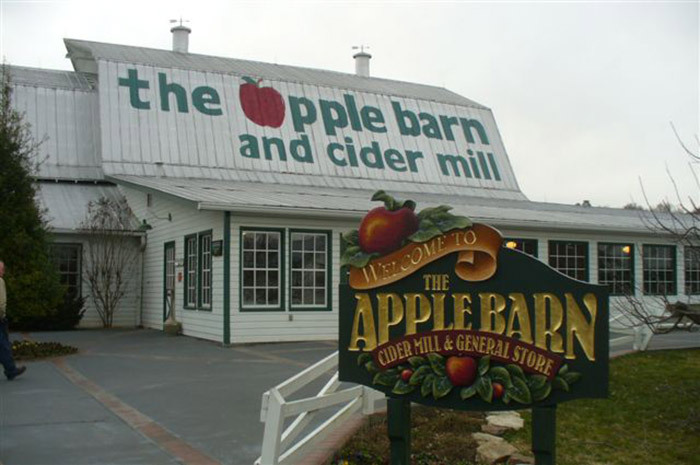 Apple Barn Pigeon Forge has been providing guests with quality country cooking since 1987. Having expanded to include the Applewood Grill and several additional dining rooms, Apple Barn Restaurant has become one of the most-love restaurants in Pigeon Forge by families who visit the area year after year. Apple Barn Restaurant invites you to come sit on it's porch and relax in a rocking chair. Walk down to one of the gazebos that overlooks the Little Pigeon River. There's something reminiscent of being on your grandparents porch at Applewood Farmhouse Restaurant, so come enjoy the feeling of days gone by as the smell of fresh bake apple fritters greets you as you make your way to your table. Applewood Farmhouse Restaurant's Breakfast - Enjoy a classic country breakfast at Apple Barn Pigeon Forge. Imagine a table filled with hickory smoked bacon, home fried potatoes, and stacks of delicious pancakes. Glasses of orange juice and sweet tea accompany your scrumptious breakfast fixins'. Make sure to order some biscuits and gravy to get that true Southern feel to the best meal of the day. Applewood Farmhouse Restaurant's Lunch and Dinner - After a day filled with shopping or putt-putt golf, swing by Apple Barn Restaurant for a filling lunch with country classics such as fried chicken, pork chops, and meatloaf as well as Applewood favorites such as Apple Julep Grilled Chicken.Enjoy sides such as greens, mac and cheese, dumplings, and, of course, fried okra. Applewood Farmhouse Restaurant's Sunday Dinner - Sunday dinner at Apple Barn Pigeon Forge provides diners with their choice of one of Applewood Farmhouse Restaurant's favorite plates along with a soup, your choice of salad or cole slaw, mashed potatoes, an additional side dish, and your choice of a decadent dessert. In addition to delicious dining, Apple Barn Pigeon Forge offers country style jams and jellies, mixes, and other food stuffs at the restaurant store. Can't wait until your next vacation to the Smokies to taste the fried goodness of apple fritters or indulge in Applewood's apple butter? You can buy a mix to make fritters of your own as well as a jar of apple butter for the road to carry the taste of Apple Barn Restaurant back home. Stay near all the restaurants in Pigeon Forge! Renting one of Cabins USA's Pigeon Forge, TN cabin rentals or Sevierville cabin rentals places you right in the heart of all the action. From restaurants in Pigeon Forge to awesome shopping, you cabin places you just minutes away, all while provide you with the comforts of home and much more space than a hotel room.